As a Law Firm, you want to evoke an image of professionalism, expertise, and credibility, both within your four walls, and in the image you project to the outside world through your use of marketing, including your website. For many of your website visitors, this is the first experience they have ever had with finding a lawyer and is often the first exposure they have to you and your Law Firm. The anxiety over making the right choice for representation can be stressful enough, on top of the reason they need your services in the first place! By giving proof that you are a trustworthy firm that is able to handle their case to their satisfaction, you can win more clients who may otherwise have continued their search for a lawyer they can trust. How Do You Prove Your Trustworthiness? There are many ways that you can prove that you are a ‘Real Law Firm’, ready and able to handle their case. By utilizing trust elements throughout your website, you can build your credibility before they even pick up the phone to contact you. Trust elements come in different shapes, sizes, and forms. 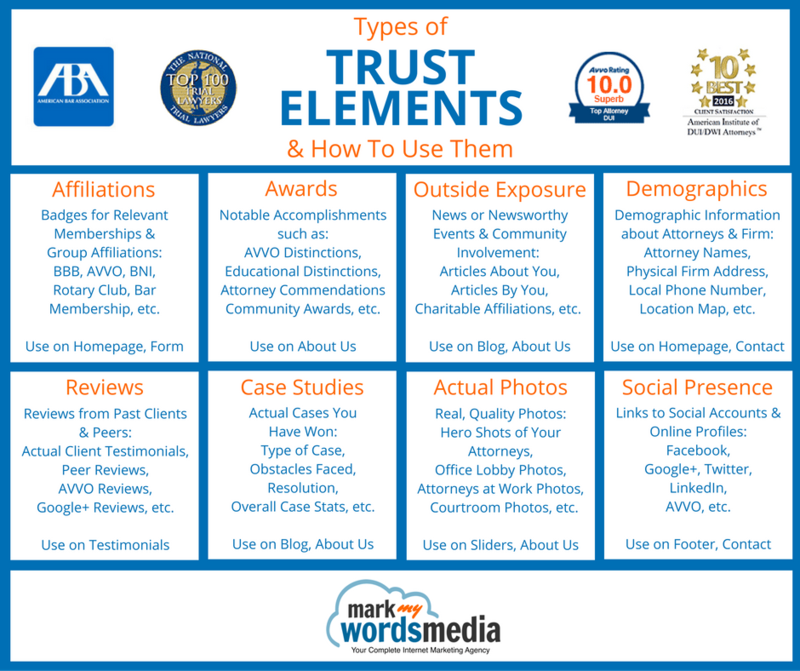 It is important to understand the different types of trust elements, when to use them, and how they impact the perception your website visitors have of your Law Firm. All of the trust elements we discuss will assist in one or more of these areas. You will most likely recognize them from other websites you have visited, and they may even exist on your own site already. However, if you are missing any of the trust elements below, let us know so we can update your website and help you win more clients! These provide Proof of Esteem. Utilizing these recognizable organizations banners and badges on your site helps to “borrow” trust through your affiliation with them. If you are a Rotary Club member, potential clients may feel a connection to that organization, and may choose you solely based on that. If nothing else, it will create a subconscious link between you and those trusted organizations. Placement: These work well on your Homepage near your main services, near your form, or on your ‘Contact Us’ page. 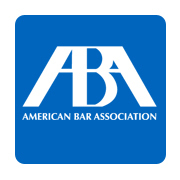 These provide Proof of Ability, and can include any awards or accomplishments your Firm or Attorneys have received. This is the same as hanging awards on the wall in your office. Prominently featuring your awards helps to instill confidence in your ability to perform. Not only do you claim that you are a great lawyer, but all of these outside groups/organizations think so, as well, and gave you an award as proof of your excellence. So use that to your advantage on your website! Placement: These work well on your “About Us” page. If you have virtual badges or award icons, these can also be used on your Homepage with your Membership Badges. If you are approached with an opportunity to receive an award that you must pay a fee to be considered for, it is most likely a fraudulent award. These awards, while they look great on the surface, are often not worth the money required to obtain them. We can provide you with plenty of readily available trust elements without any additional cost. If you are suspicious about the validity of an award, just let us know, and we will investigate it for you. This can provide Proof of Ability or Proof of Esteem, depending on the type of exposure. If you work with a community organization or are involved in charitable activities, then noting your affiliation with these organizations shows that you are a respected member of the community who gives back. This speaks to your reputation. News articles about your prowess, or articles that you write that have gotten media attention, would be more targeted at displaying your ability to perform. Placement: Any news style items would be best used as blog posts on your website. Charitable affiliations, depending on the level and type of coverage, may be best used in your ‘About Us’ pages, or if full articles, would also make great blog posts. This is mainly targeting the Proof of Existence component of trust building. By displaying actual Attorney and Law Firm information, the potential client is able to verify that you are, in fact, a real Lawyer. This is the easiest type of trust to build, and one of the most commonly missed. Placement: Items such as your phone number will be displayed on the top of every page. Attorney information will be used on your ‘About Us’ page, and location data and map can be provided on the ‘Contact Us’ page. A combination of these items is also commonly used in the footer of each page. Reviews are one of the biggest influencers you can add to your website to increase the level of trust potential new clients will have in your Law Firm. The opinion of others regarding your ability to perform your job speaks volumes. The better your reputation, and the more reviews you have, the better your ability to convert website visitors to clients will be. Placement: These are typically collected on a testimonials page, but are often used throughout the website to add trust where needed. Providing Proof of Ability, these are an analysis of actual cases that you have fought and won. 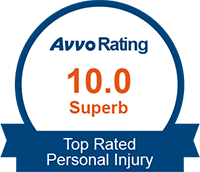 This allows potential clients the opportunity to review how you work and what they can expect from their case. Placement: Full Case Studies make excellent Blog posts, while case statistics can be used on your ‘About Us’ page, or to strengthen individual service pages. This one targets Proof of Existence. By providing actual photos of your attorneys and your law firm, the client gets a sense of what to expect and your level of professionalism, beyond simply proving that you are a real person. Stock photography adds very little to a website, especially if they just saw an image of the same stock lawyer on the last website they visited! Placement: These are excellent for use on sliders and your ‘About Us’ page. May also be used across the website where appropriate images are needed. By having and maintaining active Social Profiles, you are contributing to your Proof of Existence. By being responsive and active on your social media, potential clients are able to get a feel for who you are, your level of engagement in your practice, and how well you work with and respond to current clients or interested parties. We immediately and automatically syndicate new content added to your website’s blog to your social profiles to help build your social presence. Placement: These are commonly placed in the header or footer of your website, and are frequently found on the ‘Contact Us’ page as well. Building trust is one of the most important elements that your website can accomplish for you. By using badges of trusted affiliations, providing accurate and real demographics and images, publishing reviews from clients and peers, and maintaining your blog, you can build the trust that you need to ultimately convert your website visitor into a paying client. As always, we are here to assist you with projecting a trustworthy, professional image to your website visitors. If you have questions, need help finding badges or other elements, or simply want to learn more about how Mark My Words Media is helping lawyers succeed online, then give us a call at (877) 721-8491.